Click here for beef cuts, prices and bulk purchase information, as well as where to buy our beef. Labels are vague, and there’s little regulation. It’s up to you to find out where your food comes from. How our animals live, and how they are treated is very important to us. 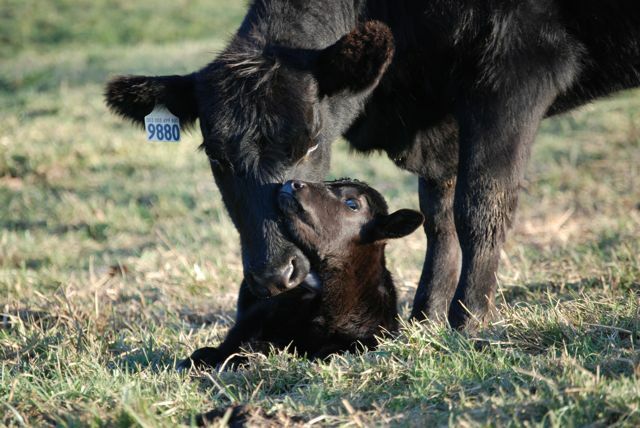 As an Animal Welfare Approved farm, if we decide to sell live calves or cattle, we are only allowed to sell them to other AWA farmers; we are also required to use a meat processing facility that is also Animal Welfare Approved, which means they also adhere to strict animal handling, slaughter and welfare practices – we (and you) can have faith that they will be treated according to high standards. All our calves, heifers, steers and momma cows are born, bred and raised on our farm. Our Registered Angus bulls are carefully chosen for specific traits – calving ease (to eliminate calving problems! ), mothering qualities (like lots of milk for healthy, strong babies), marbling genetics (check out that beautifully marbled ribeye steak!) and the ability to thrive on grass and forage only. Ever seen a 100% grassfed ribeye like that?? For a weekly update on what’s in stock, recipes, and farm news please subscribe to our email newsletter HERE. 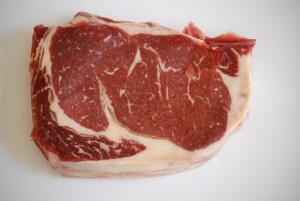 Our beef is processed at a USDA certified and Animal Welfare Approved facility and dry aged for 2 weeks. Aging helps tenderize the meat and gives it unbelievable flavor. It’s then vacuum packaged and flash frozen to protect freshness. Nature intended cows to consume forage (grasses and other natural vegetation) as the mainstay of their diet. That’s common sense, but studies have actually been done to prove this is the right diet for them, resulting in overall health and disease prevention. This in turn produces the healthiest and most nutritious beef. 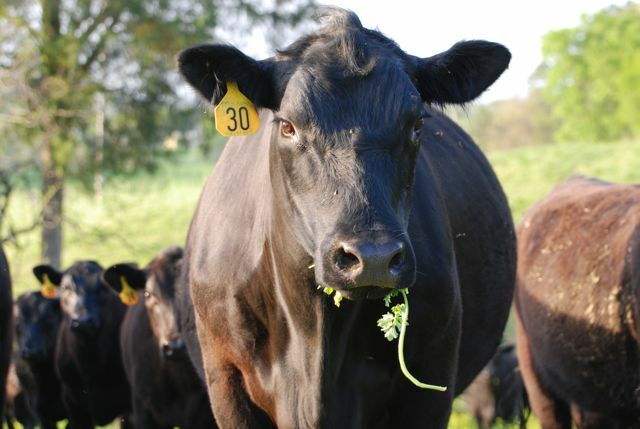 We raise our beef on 100% grass pasture, hay and grass or alfalfa baylage (hay is baled while still wet, wrapped in plastic and allowed to ferment, producing a very nutrient dense feed for the winter months) and practice rotational grazing and seasonal forages. We don’t feed ANY grain or use hormones to increase weight gain. They have free choice access to fresh water, minerals and salt. Cattle raised on a forage-only diet is cattle the way nature intended. Corn and other commercial feeds used to fatten cattle are not the natural diet of herbivores. Cattle that are fed anything other than grass or hay are not getting the proper nutrition needed for their optimum health. Corn and other feeds are a faster, cheaper way of adding weight with the end result of better profits. Beef cattle are sold by the pound, so the heavier thay are, the bigger the profit. It’s also common for beef cattle to have hormones implanted to speed growth; these practices result in increased used of antibiotics to avoid illness resulting from these conditions. 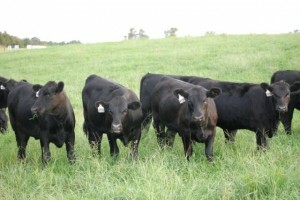 Health benefits of grass fed beef go beyond avoiding hormones and antibiotics. Grass fed beef has high amounts of Omega 3 fats. We need Omega 3s for brain health and many other vital functions. Humans cannot produce Omega 3s (as can animals) and must obtain them from food; the typical American diet is dangerously low in Omega 3. A lack of these good fats is attributed to many of the health problems plaguing Americans, including diabetes, hypertension, arthritis, cancer and heart disease. The level of Omega 3s drops dramatically in cattle that are not fed forage-only diets, and the level of Omega 6s rise to levels that are considered unhealthy. Grass fed beef is also a source of CLAs, which is linked to reducing the risk of diabetes, obesity and immune disorders. Cattle fed grains or other diets do not have the proper, healthy digestive functions, and this is where ecoli and mad cow disease start. A study done at Cornell University showed the ration of ecoli in grain fed cattle to grass fed cattle to be 315 to 1. For more information on the safety of your food, visit www.eatwild.com/foodsafety.html.